The several parts of our local government each have their own powers and responsibilities. The Board of Education teaches our children. The Fire Department and EMS aid us in emergencies. The Highway Supervisor maintains and improves the roads. The Town Justice judges the accused. The Town Clerk keeps records, collects taxes, and issues licenses. Our town board combines the executive and legislative branches of local government, representing the people. Four councilmen are elected for four-year terms, two every two years. The supervisor is the fifth member of the board. He presides over monthly meetings and has limited administrative powers. He also represents Franklin on the County Board of Supervisors. In contrast with the other branches, the town board has diverse responsibilities for running our municipal corporation. Town boards are charged with securing the public health, safety, welfare, comfort, peace, and prosperity of the town and its inhabitants. In evidence at every monthly meeting is their greatest responsibility of all: the budget. With the power of the purse, the board exercises stewardship of the highway department, the clerk’s office, and the justice’s court. The school and the fire department control their own funding. The limited resources of small towns require boards to be thrifty, in order to minimize the inevitable annual increase of property taxes. Each October, the board reviews a preliminary budget for the next year, prepared by the financial officer (in Franklin, the supervisor) and in November, after a public meeting, votes it in. This sets the town property tax levy for the upcoming year. The five elected board members appoint two dozen town officials. Almost all are positions required by state law. Many appointments are made at the annual organizational meeting, which is the second meeting in December, tucked between Christmas and the end of the year. This date may be a relic of the requirement that towns provide an annual accounting between December 28th and 31st – a requirement eliminated in 1971. Appointed officials are delegated with some of the power and responsibility of the Board. For example, the assessor is appointed to appraise property values, which allows the property tax levy to be apportioned among land owners. Less frequently in evidence is the responsibility to make law, a responsibility of town boards since the New York State Constitution was revised in 1963. Most years, our board passes not a single ordinance, and the most ever passed in one year were three. Many of the ordinances were either required by state law, such as fire prevention and building codes or flood plain maps, or recommended by Delaware County. In the last fifty years, our board has passed perhaps half a dozen ordinances on its own initiative. Town boards have the power to enact zoning restrictions. Twelve of the nineteen towns in Delaware County do not have zoning, but Franklin enacted general zoning in 1990. Since empowered in 1964, zoning has been the most common subject of ordinances, comprising half of those passed, including penalties for violating subdivision zoning (1986), and restrictions on mobile home parks (1981), dumps and dumping (1987), and wind turbines (2007). 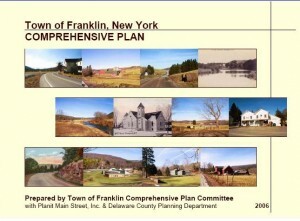 In 2006 the board revised the Franklin Comprehensive Plan with considerable input from we the people and aided by a consultant, Planit Mainstreet. By law, actions by the board must be guided by the Plan. The town set out sixty-eight recommendations, but few have yet been implemented. Town boards may restructure town government somewhat, although many changes require a public referendum. Recently, Franklin has waived residency for the code enforcement officer (2001) and allowed the appointment of an assessor (1996). The Board has powers to regulate and license businesses. Historically, our town has banned the sale of alcoholic beverages, unlike any of the surrounding towns. Only since 1996 has beer been sold for home consumption. Our delis and restaurants are still banned from selling beer or wine for consumption on site. The licenses that our Clerk does issue, for dogs and hunting, are authorized by state law. Elections at the local polling station are overseen by the board. The Board has the power of eminent domain, which could be used to obtain easements for local roads. However it has not been used within living memory. Treadwell lighting and water districts are administered by the town board because the hamlet lacks its own government. In conclusion, one must ask how well our town board has fulfilled these responsibilities. Did the board exercise its powers for good or has it not done much at all? Has it carried out the recommendations provided in the Comprehensive Plan? Should a town board do more for its citizens than clearing the roads and managing the budget? The answer is in the ballot box.